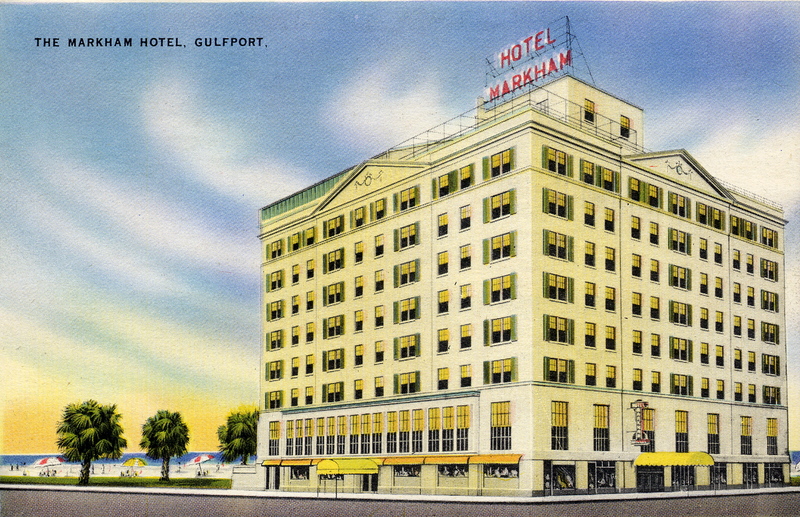 The Markham opened its doors on January 31st, 1927 at the southwest corner of 21st and 14th Streets in a burgeoning downtown Gulfport. The hotel was named for Charles H. Markham, a former president of the Illinois Central Railroad. Markham wasn’t an investor, but had actively encouraged the building of a prominent downtown hotel. Gulfport’s other grand hotel, the Great Southern, was even then beginning to show its age and catered to a resort clientele. The Markham would be all business, though not always. Its opening night festivities included an orchestra borrowed from the Roosevelt’s Blue Room in New Orleans and normally sober townsfolk partied the night away in a blaze of color and light in the shimmering Crystal Ballroom. From an architectural standpoint, the Markham is a good example of the period- a mildly neo-classical, but essentially typical business hotel of the period. Exterior shutters and a glass enclosed roof terrace added a bit of tropical sprightliness to an otherwise staid building. Inside, the spacious lobby had glistening marble and handsome carved paneling. 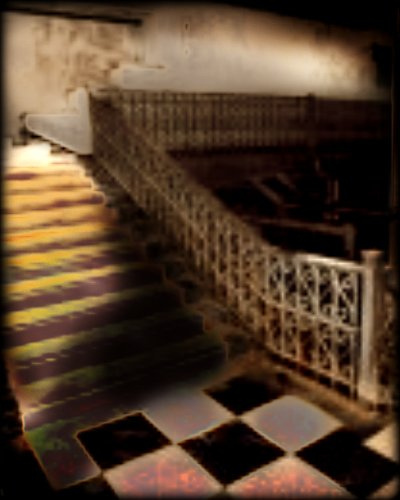 A grand stairway swept patrons to the mezzanine where they could dine in an elegant, formal dining room. I once read somewhere of a certain manager’s wife who would dress to the nines each evening and make an appearance in the lobby before sweeping up the grand stairway to her dinner. The Markham would see a number of managers come and go in its days as a hotel. Local resident and historian Anthony Kalberg recalls that the pool was one of the favorite spots for children lucky enough to be in the Markham’s popular swimming club. The pool was covered with a sturdy trellis which had a system of sprinklers installed within. At the whim of a lifeguard, the vines above would spout forth mists of cooling water jets so that the children could at least swim, if not sing, in the rain. The rooftop garden was completed shortly after the opening and was another smash hit. Kalberg recalls an evening there in the late 1960s where the room was so bedecked with palms and ferns that it seemed a tropical forest, complete with a bubbling fountain at its center. He also spoke of the Markham as the symbol and center of a bustling and vibrant downtown, where the lobby served as both a social gathering place and a symbol of the city. At Christmas, the scene was especially grand with busy shoppers going to and fro bearing brightly wrapped packages, but all would stop to admire the glittering Christmas tree and the elaborate garlands and boughs throughout the ornate lobby. In a way, the lobby of the Markham was a local equivalent of the famous clock at New York’s long vanished Biltmore. The palmy days of the Markham would soon take a more sobering turn. As business shifted away from the grand old hotels to newer, more modern establishments, so went the Markham. The Security Savings and Loan Co. acquired the hotel in the 1960s. Flagging business led to the locking of the Markham’s doors in 1970, but after the hotel’s contents were auctioned off, the owners decided to keep the hotel and renovate it into an office building. Thus did the Markham become the Security Building. Instead of the wrecking ball, however, the Markham found renewal as an office building. Unfortunately, the swimming pool, Sundial, gardens and all of the outbuildings disappeared during this time for a parking lot. Still, the solid old hotel’s future seemed secure as an office building. It was even renovated again and renamed the Markham Building in 1987. The Crystal Ballroom hummed with special events and the Markham Cafe operated on the ground floor. So it remained until the wrath of Katrina flooded its marble halls with muck and debris. Following the storm, the building was sold to a lawyer from New Orleans who did little more to preserve the building than to install a cheap blue plastic tarp over the roof, thus allowing the elements to ravage the interior of the hotel. As it stands today, there’s no denying that the building needs attention. What should be remembered is the example of Jackson’s King Edward which stood empty for forty three years before its day of redemption. Does Gulfport wish to follow the sad and ignorant example of Wichita? Wichita’s city leaders also decided that they were tired of seeing an “eyesore”, in this case the majestic Art-Deco Allis Hotel. Instead of simply mothballing the building and waiting for a developer, they chose the irreversible path of implosion. Nothing marks the site today. I am glad to see someone taking Gulfport Main Street to task for their anti-preservation actions. If the Hotel Markham were only an isolated instance, perhaps they could be forgiven. However Gulfport Main Street has a record of being on the wrong side of many preservation issues since it was created. Nearly 3 years later and still as painfully true. 3 more years later and nothing.. I agree with “Theodore”… Gulfport Main Street Association should be rallying people behind the preservation of this wonderful old place. At least someone has stepped up and purchased the place when it was considered hopeless by all others. In this economy progress takes time and the City of Gulfport has proven that by it’s lack of progress in all areas of Gulfport… except with it’s own interests in downtown. My husband lived in Gulfport as a child. We currently live in New Orleans and drive to the Coast at least once a week. My husband loves Gulfport. I am dismayed at the condition of the Markham everytime we visit Gulfport. I am currently writing a novel which features the Markham Hotel. The hotel, if renovated, would I’m sure draw guests, as it occupies such a prominent location on the beach and is very convenient to shopping and the Interstate. 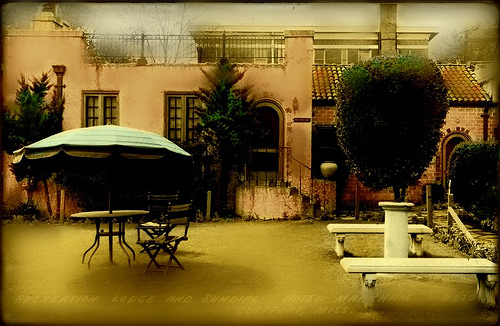 I hope one day to see this grand old hotel restored to it’s original state! My piano recitals (late 1950’s) were always held in the Markham Hotel. What memories I have of Mrs. Anderson and our gala performances!! I have a vintage postcard of the Markham that I found in a junky antique barn in North Carolina about 15 years ago. I remember the first time I went into the Markham in the early 80’s. I was so impressed by its aging beauty. The downstairs was still very awe inspiring although the upstairs needed work. I went home and ask my hubby more about it. He told me about the pool which had been filled in. I thought – what a shame. His Aunt Margie had been a housekeeper there as a teen. She told fond tales of her time there. Auntie had also worked at the old Edgewater before it took 3 blasts to shake its foundation to make room for the mall. What a loss. There was truly room and need for both to coexist. What I am trying to say is this . . . We have next to nothing left to save of old downtown . . .Please oh PLEASE save the Markham. Redo the pool and the rooftop garden and a fine restaurant. I think executive suites and apartments could be half of the rest and then a few really nice day rental hotel type suites. or turn it into condos. Who wouldnt love to live so close to the beach. I sense the romance and persona many of you have for, and bring to, this architecturally significant building. I spotted the seemingly abandoned building in August ’10 and was immediately moved by its grandeur and prominence. I may be able to help in the effort to bring the Markham back to life. Having been involved in the successful effort for one of the most notable hotels in New Orleans after similar damage by Katrina, I’d need some key information; however, if any of you caring past patrons, concerned neighbors or friends of the Gulfport Markham can lend facts, I would be happy to pursue it and proud to say that I was involved if it were to happen. I loved this place when I was growing up in Gulfport. How I wish I could return to those pleasant, stress free days. Going to to the pool was better than than going to heaven. I don’t live in Gulfport anymore, although I have nothing but fond memories of it, but I certainly hope this piece of history is cared for. Gulfport was, and is, a grand city – take care of the historic landmarks – please. Does anyone know the name of the lawyer who owns the Markham. I’m trying to grt permission to enter the building for photography purposes befor it’s demolished. Where did you hear that it’s being demolished? This would be calamitious, if true. Is the city simply trying to keep things quiet about this? There has been nothing in the press recently. Very, very disturbing. I spoke with Mr. Rambeau yesterday. He assures me that the owner is working with him to find a buyer presently. I think things may be more hopeful for the Markham now- especially so with a new casino scheduled to open nearby. I plan to try to reach the owner next week. Demolition, fortunately, does not appear to be in the picture. I’m interesed in the building! Who is the owner? Is there a number to contact someone. What is the asking price for the building. I’m from Gulfport, but working in Nashville. I would love to save this historic landmark and return it to a premier hotel. I have an idea that would be perfect for the area! I still have a home and family there. Haven’t been able to get back since the hurricane. Fred Rambeau of Martiny International is the owner. The company is in New Orleans. OMG, thank you! I owe you!!!!!!!! When time allows, please contact me regarding this property. I am interested in its preservation and getting it back into commerce. I would be happy to pursue it and proud to say that I was involved as part of the team, if it were to happen. Almost one year later. Our new casino has yet to begin the promised construction. Does your hope for the Markham still hold true? Sure looks bleak but hope for the best. I’m sitting here right now holding Courtesy Card No. 3304 from the Hotel Markham. Dad is 97 (semi-retired now) and he and Mom honeymooned at the Markham in 1946. After that he was a regular business customer. Please save this landmark! I want to use his courtesy card someday! Some of my fondest, earliest memories of my childhood going there with my grandfather, Boss Poole of Gloster. As a small child in the late 50’s I remember the aroma of coffee in the mornings, the checkerboard pattern of the lobby floor, and those brass accordion things that would slide closed on the elevators. Something tells me my grandfather liked to go there for domino tourneys. This grand place created memories that have stayed with me over half a century! I would like to work with whatever group may be formed to renew the Old Markham Hotel. As a life long resident of Gulfport and Harrison County I do dearly love the old structure. I was Executive Director of the Gulf Regional Planning Commission which was housed there on the fourth floor in the early 70s. As a teenager I swam in the pool almost every Saturday as I grew up. My office was in the Markham for 12 years. Somehow I missed the “intrinsic evil.” However, I have many fond memories, among them the annual prom season that would bring the charming children from Wiggins, with their big eyed worldly innocence, come down to revel in the big city glamor of the Crystal Ballroom.